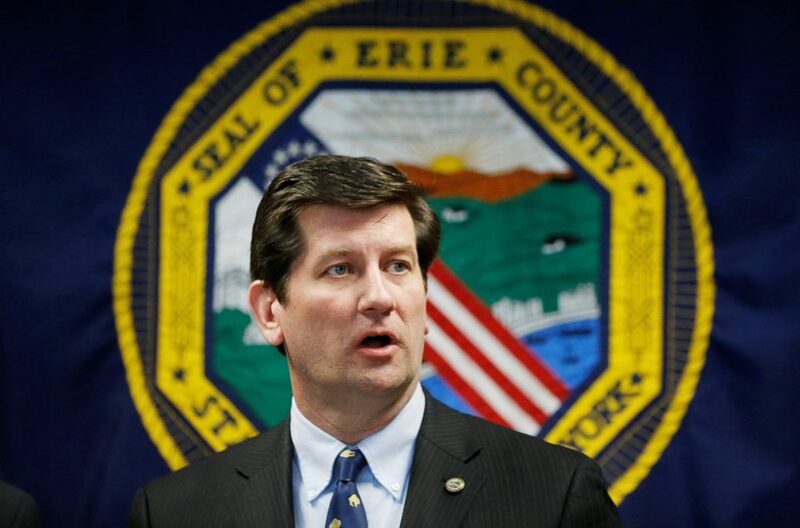 In the past two weeks, Erie County Executive Mark Poloncarz has begun traveling with two armed Erie County sheriff's deputies and security vehicles to his scheduled events. Poloncarz hasn't had such a security detail until now. But recent threats prompted him to accept a trained "dignitary detail" from the Sheriff's Office, he said. On the Friday before St. Patrick's Day, a suspicious package arrived at his office addressed to him as "personal and confidential." It had been hand-delivered to his office and had no return address. Nothing inside turned out to be dangerous, but the incident put building security on alert, he said. Five days later, an incident occurred at his house that prompted him to call the police. He declined to elaborate, saying he doesn't want the information to harm the investigation or encourage copycats. He accepted police protection upon the recommendation of Buffalo police, Erie County Central Police Services and the Sheriff’s Office, he said. That includes special transportation measures and two sheriff's deputies who travel with him to his scheduled events, among other security measures that he declined to publicly discuss. "It’s completely changed how I have to go about my work routine and daily life," Poloncarz said. "I’m not thrilled with it." "Based off the recent threats made against the county executive, we believed a security detail was needed," Wipperman said. Already, Poloncarz's additional security has brought political attacks from rivals. Erie County Republicans accused Poloncarz of hypocrisy after his security team parked county vehicles on the Albright-Knox Art Gallery's drop-off loop. The vehicles did not occupy parking spaces for handicapped drivers, but they did block the curb cut to the main entrance. A patron and her disabled mother tried to access the museum entrance but were hindered until museum staff intervened. Republicans retweeted an old press release from Poloncarz denouncing then-County Executive Chris Collins for pulling his personal vehicle into a handicapped space before walking in a parade. But the release was marked up by a former Collins staffer to replace Collins' name with Poloncarz's. Poloncarz said the two situations were not the same, but he apologized for the incident. He said his security was doing a sweep of the museum the day before the State of the County address and their vehicles should not have remained parked there. Meanwhile, Republican County Comptroller Stefan Mychajliw and County Legislator Lynne Dixon, I-Hamburg, who is challenging Poloncarz for the county executive's seat, questioned the cost of his security detail and what other work the assigned deputies are now giving up. "If there is a credible threat to him and he is in need of security, then that’s fine, but I have questions," said Dixon, adding that she wants an update on the status of the investigation. "They are assigned on a rotating basis so that none of our normal operations and investigations are hampered," he said. The Sheriff's Office tries to assign Poloncarz's security to coincide with the staff's regular working hours to minimize extra costs, he said. But depending on the date, time and location, some assignments result in overtime. Mayor Byron Brown has two people who take turns providing security when he is at City Hall or at an event outside his office. Mychajliw said Poloncarz is not such a high-profile figure who merits such extra protection. The county executive would better serve taxpayers by applying for a pistol permit and carrying a concealed handgun, the comptroller said. "I’m sure there’s a significant cost involved in removing these highly trained officers from their specific detail to protect the county executive like he’s the president," he said. In February 2017, Mychajliw said he received threats from an inmate, believed to be mentally ill, who threatened to "exact revenge" against him with a gun. That led Mychajliw to apply for a concealed carry pistol permit and purchase a Glock at his own expense. The inmate has since been in and out of jail. "I thought it would be silly to ask for 24/7 police protection," Mychajliw said. "Our law enforcement should be used to fight crime on the streets, take drugs out of the community and fight the very serious opioid epidemic."